Mixed Feelings Dazed Thoughts: Goodbye Banda and my favorite peacocks! Goodbye Banda and my favorite peacocks! Saying graceful goodbyes has never been my forte and saying a final goodbye to a place twice over, happens rarely in life. Its difficult as it is to come back and live in a place one had left forever once. And when it comes to leaving yet again, its not just living through a feeling of deja vu but also one has little or no emotion left. This time around, not just me but everyone knew, my stay in Banda will be short and limited to the specific purpose of conduct of General Elections alone. Once the purpose was accomplished, it would have been a surprise if I were allowed to continue for long. Carrying absolutely no baggage with me ( both the literal and the emotional kind! ), it was just a matter of biding time. The only thing I looked forward to at the end of the sweltering hot days was the bevy of birds who would come to roost in the lush overgrowth around the house. Much as I may have remain detached during my stay, the fact that little N spent hours chasing peacocks and parrots on her tiny feet, filled my heart with unbounded glee. These peacocks and parrots and the innumerable other birds who roosted in the house had been an integral part of my life during my previous stint too (even before little N was born!). So much so that when the temperatures would rise to 50 degrees (yes, Banda is often the hottest place in this part of the country), not just me, but even the caretakers of the house would be worried about the birds and would deliberately leave the tube well leaking during the day and keep water baths all around the campus. When I started blogging about Bundelkhand, I wished I could do a post on 'Bird-watching in Banda' but did not possess the right lens to click their pics. Once we started noticing birds, me and A invested in a good telescopic lens over time. It was only fitting that when I had to bid adieu this time around, (and it did not take longer than I expected) the only living beings who bid me farewell were my dear birdie companions I had loved and looked forward to seeing each day. And boy! 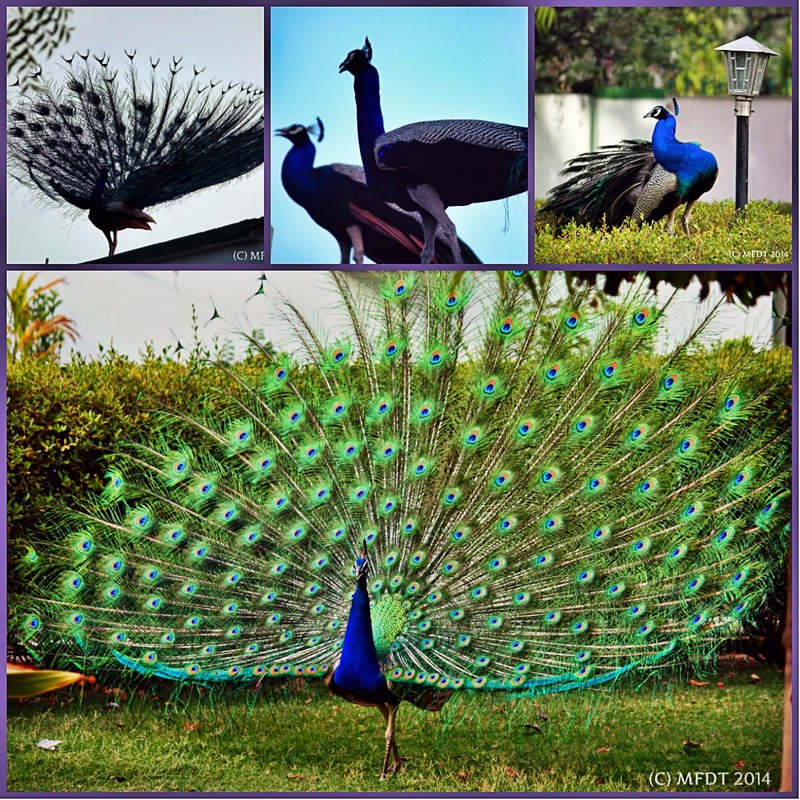 the performance by the peacocks was truly mesmerizing..
During the summers of 2012, when a college friend Av and his wife Sh had chosen to move home to Banda permanently giving up a plush job and urbane lifestyle in Mumbai, I was both surprised and happy. It took immense courage to give up so much just to be with one's family. During my first meeting with Av and Sh then, one of the nicest things about my house I remember telling Av was a pair of horn-bills who had just then started nesting in the house. To me somehow, in some unconscious corner of my mind, that pair signified Av and Sh's home-coming. To my sheer delight,just as Av and Sh welcomed little V into their lives, that pair has also expanded into a family of six. 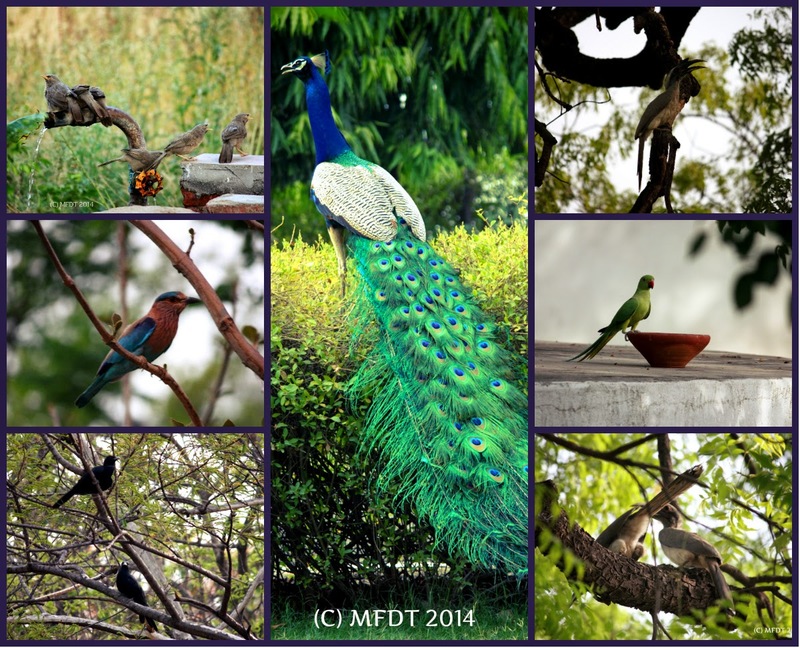 Apart from the horn-bills, the roosting calls of the babblers, cuckoos, peahens, Indian Roller (Neelkanth) and the myriad other winged creatures made each evening spent in the house both enchanting and enjoyable. It was also a source of immense happiness to see the first flowers in the row of Gulmohars we had planted in the house. 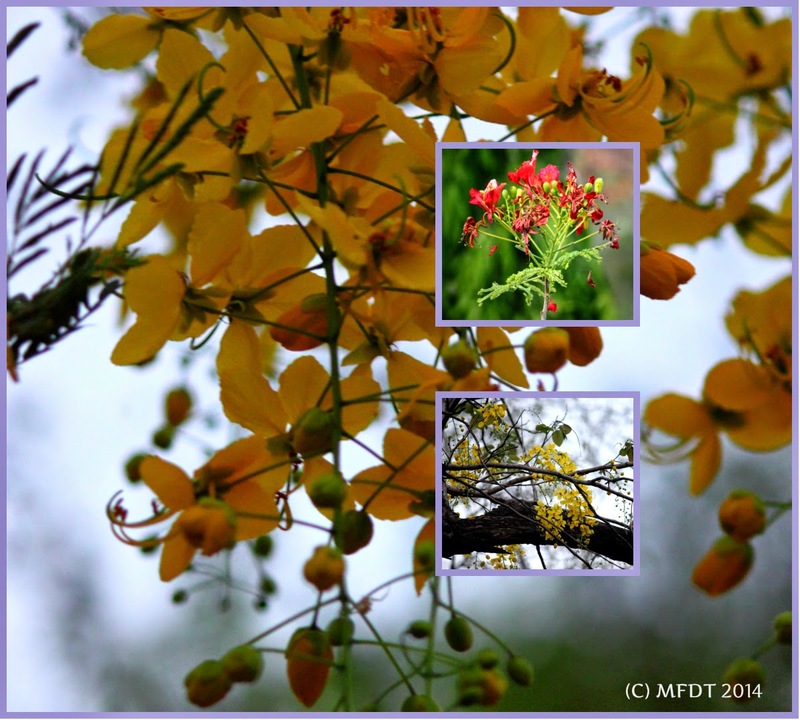 Feeble as they were in the oppressive heat and inclined as I always am towards laburnum flowers (thanks to JNU! ), I can not help but imagine the sheer beauty of these trees when they develop fully and grow strong trunks. In a landscape which turns brown for miles on end in the summer months and where not even a shard of grass grows, if it were not for the bewitching trinity of Palash (Flame -of-forest), Amaltas (Laburnum) and Gulmohar, this place would have been a desert to look at. The road from Karwi to Allahabad traverses through a magnificent natural forest of Palash which is sadly being fast ruined. While millions are spent on afforestation drives each year, and only a minuscule proportion of those saplings survive, these sturdy species broadcast their seeds through nature and survive wonderfully in these hostile conditions. My stay in Banda has given me memories to cherish for an entire lifetime. It has taught me the true meaning of resilience, perseverance and above all, hope. It wasn't at all difficult leaving either. Just that it is difficult to live with the knowledge that a place which contributes so much to the development of other 'big' cities, should itself remain so grossly neglected and misconceived not just in terms of basic infrastructure but also people's perception and sentiments. now forgotten how to fly. that left her in a sigh. Am submitting these farewell pics for Artistic Inspirations Challenge # 107 based on Memories. Fantastic. Madam you are a great writer. After reading this anybody would like to visit and settle in Banda. beautiful pics dear. ure going to give AD a tough competition next time round in mussoorie! School poems one still remembers! Of Few Poems and Amaltas.. Copyright. Theme images by kim258. Powered by Blogger.